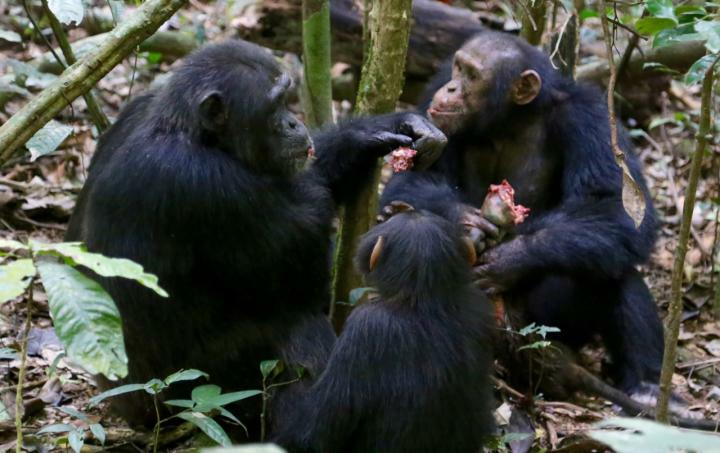 "Chimpanzee hunting success increased when more chimpanzees participated in the hunt or in joint prey searches prior to the start of a hunt", says Liran Samuni of the Max Planck Institute for Evolutionary Anthropology and first author of the study. "The sharing of meat following successful hunts encouraged hunt participation, as prey catchers shared more frequently with hunters than non-hunters, despite similar begging attempts." Furthermore, the researchers found that chimpanzee hunting behavior was associated with the activation of oxytocin, a neuro-hormone established as a facilitator of cooperative behavior in humans and other animals. Oxytocin activation during chimpanzee hunting is a potential mechanism facilitating cooperative hunting. "Our new study provides strong support for the cooperative nature of hunting behavior in some wild chimpanzees, likely facilitated by neuroendocrine and behavioral mechanisms", says senior author Roman Wittig.